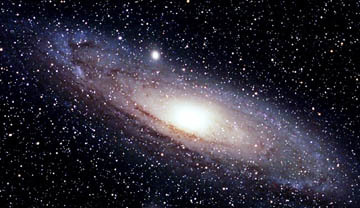 The Andromeda Galaxy is a large spiral galaxy very similar to our own Galaxy, the Milky Way. It is over 65,000 light-years in diameter and approximately 2.2 million light-years away from Earth. From Earth to the center of our Milky Way Galaxy is 8,500 parsecs ­ about 26,000 light years ­ the densest region. Andromeda image by T.A.Rector and B.A.Wolpa/NOAO/AURA/NSF. March 3, 2005 Sweet Briar, Virginia- The current British journal, Nature, features a report about a powerful and repeating burst of radio waves toward the center of our Milky Way galaxy that are unlike any other radio bursts ever monitored on Earth. The unique event took place the night of September 30 to October 1, 2002. It has taken three years for the data to be thoroughly analyzed, compared to archive data, and finally reported publicly as a unique and puzzling event in human study of our universe. The lead scientist on the Nature article is Scott Hyman, Professor of Physics at Sweet Briar College in Virginia, who for five years has been studying the Milky Way's galactic center for the Naval Research Laboratory. Next PostNext Subterranean Life On Earth – and Mars?